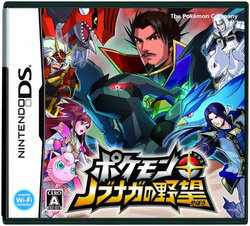 Pokémon + Nobunaga's Ambition is the latest Pokémon title due to arrive on DS, hitting Japanese stores on 17th March. Many of you may be asking, what on earth is Pokémon + Nobunaga's Ambition? As detailed by Andriasang, and as the title suggests, this is a cross-over between the well known Pokémon franchise and Tecmo Koei's Nobunaga's Ambition series. The latter is likely to be unfamiliar to most gamers outside of Japan, though the game features quite a few common Pokémon traits, such as bonding with and developing the famous creatures. The main action appears to be based on strategic battle, with two sides of six Pokémon facing off in 17 different kingdoms. Despite launch being only two months away, substantial details are scarce. It may be a Pokémon title, but we'd suggest that this is very unlikely to appear outside of Japan: if it did, however, would you be interested? Not a huge Pokémaniac, but this sounds interesting. Can't wait to learn more. Yep, definitely - if the Strategic battle system is good! Nobunaga is featured in Samurai Warriors Chronicles. . . . . .
My kids would eat this up. All they play are Pokemon games, Japanese historical fighting games, and strategy games. I'm not sure who or what Nobunaga is but I'm fairly sure he's appeared in every game ever made, and violence ensues. "Who knew?" I knew actually. Read about it a few weeks ago but almost forgot until you mentioned it. I have never really liked Pokemon, even though I was about the right age to when the craze hit back in the 90s. But this actually seems interesting. I'd keep my eye on it just to see how it works out. They announced this over 2 weeks ago. Not a huge strategy game fan, but a game about Pokemon in a war setting? I'll give it a try. Stupid Game :/ Why not 3DS? I love pokemon... but this looks like a really lame crossover. What's with the haters? I thought this sounded awesome. Pokemon in Japanese war? Sounds cool. But I'm little worried it won't be localized. It's extremely unlikely that this will see release outside of Japan. The main series of Pokemon games have been extremely popular in the USA and Europe but side games (as well as other media like the anime) have generally done poorly. A crossover with an obscure Japanese series guarantees that this won't see the light of day outside of Japan. In terms of if I would buy it? I would have to try it first as I never played a strategy RPG and I would have to see how I like the play style before I committed to a purchase. Even if it doesn't come out over here, since it's on DS I can import it and play on my 3DS. Hell yes I would buy it! I would definitely buy it. And if it doesn't get released here, I can still import since it's a DS title. Crazy crossovers are fun! I will get one. If they don't release EU or USA version, there will be a fan translation for sure. Pokemon! Nobunaga...nobunaga...not gonna buy this one. A Pokemon tactical title. I've been waiting for Nintendo to think of something like this for ages. Consider it a day 1 when and if it comes out in NA. I have, ever since it was announced last month. Seriously, guys? How can you not know what Noburger's Addition is? Really wish it was on the 3DS, but I'm sure it's going to be an incredible must-buy either way. I'm more interested in this than any other upcoming Nintendo game that we've seen so far. I hope the unexpected happens and this comes out over here. I absolutely would be interested. I love the idea of using Pokemon to battle in feudal Japan. It's exactly the serious twist the series needs. damn, those pokemon look weird. Wait why do pokemon need clothes? And why are they dressed like other pokemon? did you just say the Pokemon anime has done poorly in America? Dead or Alive & Samurai Warriors are two of my favourite 3DS titles and have plenty of content and DLC so I hope this bodes well for a Tecmo Koei adn Pokemon group partnership. Not a big Pokeman fan and I have no idea what this Nobunaga thing is so no. In case anybody's interested, there's a Nobunaga's Ambition game on the SNES which is available on the Virtual Console.